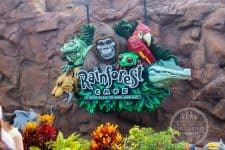 On our recent trip to Walt Disney World, we asked Home is Where the Mouse is fans on Facebook for snack suggestions in Epcot. The overwhelming response was schoolbread. We’ve been dying to try it so we made sure we made a stop at Kringla Bakeri Og Kafe in Norway. Walking into the bakery and taking a look at the selections it was so hard to choose just one item. Naturally, we decided to sample two of their delicious offerings (and made a list of things to try on our next trip). Of course, we tried the Schoolbread. We also decided to try the Troll Horn. Both treats were delicious. Schoolbread has a soft, almost doughnut like outside. Inside is a creamy custard. 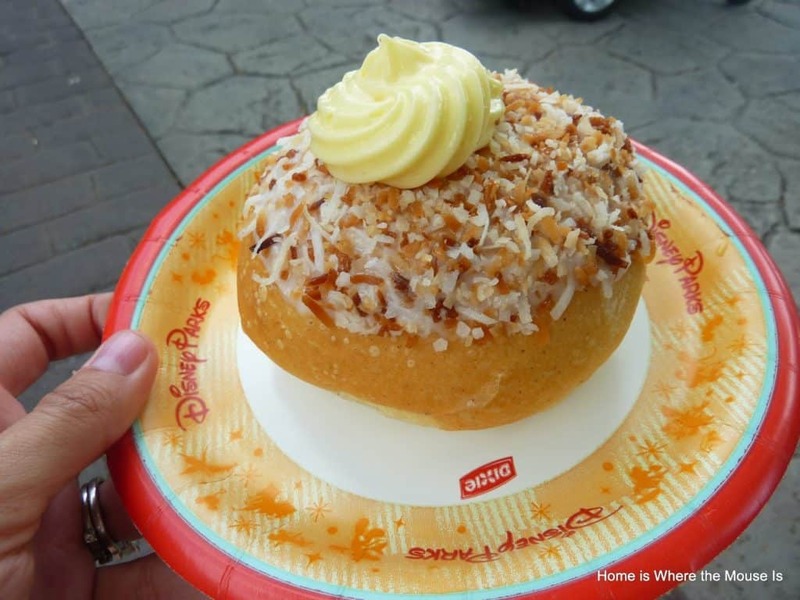 It’s topped with toasted coconut and a sweet frosting. 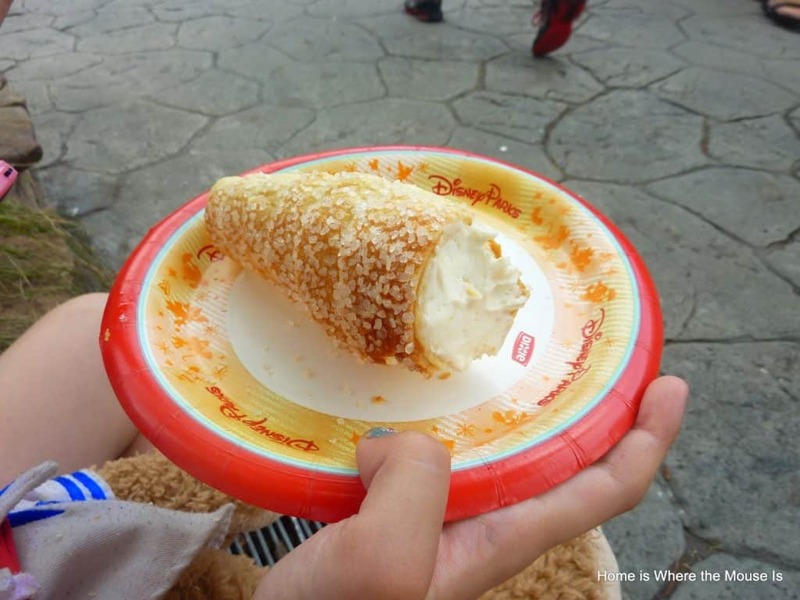 Troll horns are made of flaky pastry rolled into the form of a cone. The outside is surrounded by crystallized sugar. The inside is filled with a sweet cream tasting custard. It wasn’t as sweet as the custard in the Schoolbread, which I liked a little better. 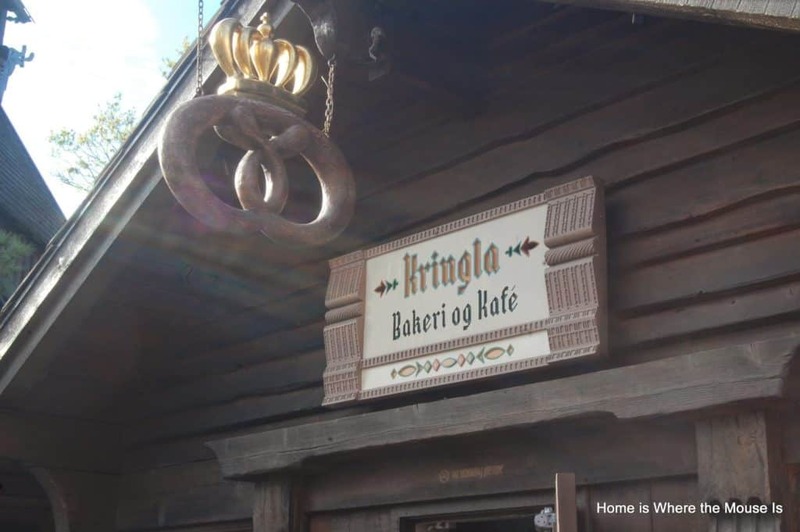 In the end, we had a great visit to Kringla Bakeri Og Kafe in Epcot’s Norway Pavilion. If you haven’t been, we (and our readers) highly suggest that you make it a point to visit on your next trip. Yum they both look great – we have tried the bread but not the horn, looks like I need to check them out on our next trip. Thanks for sharing and linking up today! I have yet to try to schoolbread, though it does come highly recommended. There are a LOT of great pastries available there – it's so hard to choose! Now I want to try a Troll Horn. The troll horns look so yummy! I'm going to have to stop in Norway for a pastry on my next trip! I'm usually looking in the store with the huge troll, so I must have been side tracked and missed the bakery for years! Thanks for sharing your reviews and photos, now I know what to look for!